Have your game reviewed online! Have you ever wonder why you may not be winning as often as others? Have you ever wonder why you are dealing in more often than others? Have you reach a “wall” whereby you don’t find yourself improving and not know what is going wrong with your playing style? Get it reviewed for more insights! Using Tenhou, an online Mahjong platform that saves your game log and accessed via an URL link, you can submit the link on SMCRM website to get it reviewed. 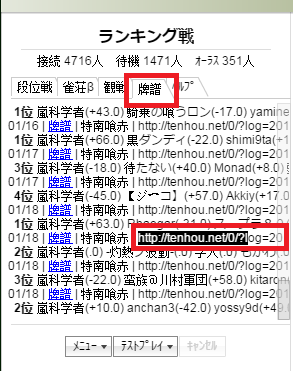 To players who do not have an account and play regularly on Tenhou, it is highly recommended to create an account and play on Tenhou as its has the best ranking system that clearly show where you stand in the large pool of players and you can review your own game log which includes looking at your opponent’s hand. It doesn’t require download and can be played on both desktop and mobile. See the picture below, select 牌譜, go to the selected game you want to be reviewed, copy and paste the link to us. Note that the link is quite long so do drag all the way to the right. Your game will be reviewed by two players, Lance and Feng who are around 7 Dan level (4 player). Lance, an East Round only player, is known to be good in his offense, melding, building value. On the other hand, Feng is good in discard reading, hand planning, situation analysis, a more defensive player. So they complement well in giving review so that the review will not be too bias to a player’s style. We will review by looking at every of your hand and discard, then provide you a logical explanation for our suggested moves. We will e-mail you our review and it will be kept confidential. We only require your e-mail and your game URL so it is ok to be anonymous if you wish to. The name section is just any name you wish to be called. The comments section is for you to specifically ask us any question you might have for any hand. For example, whether you should riichi a particular hand or not.